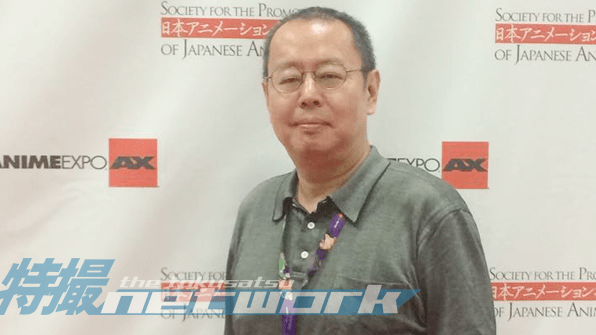 At Anime Expo 2015, the Tokusatsu Network sat down with prolific writer Sho Aikawa. Born in 1965, Aikawa debuted as a scriptwriter with Akuu Daisakusen Scramble in 1983. Aikawa is best known in the tokusatsu genre for his work in Kamen Rider Blade, as head writer for Kamen Rider Decade until episode 13, and GouGou Sentai Boukenger. Sho Aikawa was brought to Anime Expo thanks to Anime Consortium Japan, a Japanese company that started in 2014 to create an international streaming service for Japanese anime content and e-commerce. At their press conference, ACJ announced that Aikawa will be reuniting once more with anime studio BONES (Fullmetal Alchemist, Soul Eater, Ouran High School Host Club) to create a new superhero anime series titled, Concrete Revolutio. You’ve worked with BONES on various occasions. What got you started with the studio and what keeps you coming back? Aikawa: Back then, Mr. Minami, the president of BONES, was a producer at Sunrise, the studio that also produces the Gundam series. At that time, I worked at [Shippū! Iron Leaguer], a title for Sunrise and met Mr. Minami. When Mr. Minami quit Sunrise and built up his own studio, we worked on [Clockwork Fighters Hiwou’s War] and that was the first title for BONES. I have made very good friends and the studio is also close to my home. Most of all, BONES is the studio I trust the most now in the anime business. What are some of the challenges with adapting titles, like Full Metal Alchemist, versus developing your own work, like Concrete Revolutio? For existing titles, like Full Metal Alchemist, I have to take care of the love from the original’s fans as well as the love from the staff, who’ve already worked on it. That has to be respected. For original work, like Concrete Revolutio, I, myself, have to know everything as well as understand everything. I cannot ask anyone about the title. I have to look over everything and be careful not to lose the motivation until the very end. Because you have to keep toys and other merchandise in mind when writing for tokusatsu, what are some of the challenges with working with that kind of constriction? So, Toei and Bandai plan out the business model together, so that’s already there. Then they plan everything with the sponsors, the TV company, production companies– that’s for [both] the Sentai series and for Kamen Rider. This project, of course, is planned to succeed. The probability that it doesn’t succeed is quite low. For example, Marvel also reconstructs its various series, so [this type of] business model is already there. The challenge is taking on this business model for one whole year. Do you find it more freeing to work with an original work or do you prefer working within that kind of business model constraint? For a tokusatsu series, when I start to write, the [change / henshin] items [for the characters to use], the robots, the mechas, and the masks of the heroes already exist. So when I start, it’s already there. I enjoy those restraints. For original works, I have to think about everything. Like, what kind of battles, who against who, who will fight the mechas, or does [the character] use magic– so I have to decide and think about everything. The most difficult part is I don’t know if [my original work] will succeed so I have to think about a lot of stuff. So for both things, I do enjoy them in a different way. Kamen Rider Blade remains a unique entry to the Heisei Kamen Rider series, did you have a specific intention when you approached it? So in the case of Blade, it was not like I wanted to create something very new. Actually, at first, Blade was made like a typical Heisei title. I didn’t actually join at the very beginning. I watched the first parts and thought it was a typical Heisei style [Kamen Rider]. So when I got to work on it, it wasn’t like I wanted to create something new, but I just wanted to bring in some parts that are not so “Heisei-like”, for example, bring the classical “Showa-like” parts I wanted to insert. Which parts were more like Showa? In the Heisei series, they didn’t use the name “Kamen Rider” in the series. It’s the title [of the show] but they don’t say it aloud in the show. It’s more like “Kamen Rider” is a legend or code name. So I wanted to make sure to say it concretely in Blade. For Kamen Rider Decade you were the head writer for the first 13 episodes, why did you leave and is there something you wish you could’ve done to finish the series? With regards to the ending, for a tokusatsu series, it’s the case that while writing, as I think about how it’ll go on and how it’ll end, say, one [piece] of merchandise does not sell well. Bandai or the production company will [then] tell the writer. [The writer then has] two options– one is just not to use the item any more in the series, [and the other] is to look at the item a little better so that it becomes more attractive. That’s the general way of tokusatsu. So, it’s not myself who would’ve wanted to end [the series] like this. You worked on back to back series Boukenger, Gekiranger, and GoOnger, did you work on the VS crossover movies at all? And if so, was it fun connecting those teams together? I also worked on Abaranger, but for the crossovers, I didn’t work on those. Recently, I also worked on [Ressha Sentai ToQger Returns: Super ToQ #7 of Dreams] movie, so I think it’s important to show each characteristic [of each team]. But overall, there’s a common bond for Sentai. That’s why I think it’s more important not to highlight the individual characteristics of the team so much, but more the overall Sentai-like atmosphere [they all share]. Because Boukenger was an anniversary series, was there a previous team you wanted to highlight? I was the main writer for the series, so I have special feelings for the show. But it was more the production company and Toei that were very actively pushing the homages in the designs and such [from previous Sentai] in Boukenger. For me, it just had to be a good title just like all the other shows. You know that every year each Sentai series gets adapted into Power Rangers, but I heard the Boukenger adaption (Power Rangers: Operation Overdrive) wasn’t very Boukenger-like, so I was a little sad about that. The Power Rangers adaption wasn’t aired in Japan either, which is also sad. You also worked on one episode of Jikuu Senshi Spielban, how was that experience? Back then I was 23, so I was very young. I was a writer for tokusatsu magazines, like Uchusen magazine, and I would go to Toei to do interviews, for example. When I started to write [for Spielban], the situation completely changed. So, someone who I interviewed maybe a few months back, my interview partner, suddenly became my producer. So that situation change was kind of hard, especially because Toei is a very old company, so younger people find it difficult to get in and establish their own position. There’s a rumor that you are the writer for the newest Kamen Rider Ghost series, is that true? I did hear it was a rumor on some English site, but it’s definitely not me. I do know who the writer is, but it’s not me since I’m working on Concrete Revolutio. So, lastly, what keeps you inspired or help refresh you in order to come up with new engaging titles? For me, it’s a simple rule of output needs input. When I was younger, anything was a refreshment for me, like drinking for example. But recently, if I drink, I just get tired the next day. So unfortunately, it’s no longer a refresher. Instead now, I actively try to go to the cinema and watch many, many movies. One year, I attempted to watch at least 100 movies and it ended up being nearly 200. When I’m watching movies, I’m just completely inside the movie and focusing on it. My recent favorites have been Mad Max: Fury Road and I loved Pitch Perfect very much. Pitch Perfect 2 is now coming to Japan and so I’m very much looking forward to it. Thanks for the interview, it was very interesting to read the words of such a veteran both in tokusatsu as in creative endeavors in general. This is very interesting. It’s nice to see how KR Blade developed. I too enjoy working under restraints, they give you a base to work from. I know that from personal experience. It’s too bad he quit Decade early, the series would have been better if he stayed. Seriously, what the heck was on the producer’s mind when doing Decade? If the producer’s mind was only 2 part crossovers with a rushed ending, then I can see why Mr. Aikawa quit. So the Boukenger homages were from the production company. It’s nice to know Toei does care about their shows. I have to agree with his feelings about Power Rangers: Operation Overdrive. It was a disappointment compared to Boukenger. His work got truncated there. It’s too bad he’s not Kamen Rider Ghost’s head writer. I was hoping to see him work on Kamen Rider again. If he’s not the head writer then who is? This is a great interview! I’d love to see more interviews like this with writers and directors.